I am usually the girl with a plan. It's not usually a plan that makes sense to anyone else - and sometimes my plan is mistaken for spontaneity - but it's normally something that I've given a fair amount of thought to. For about a year now, I've essentially been 'plan-less'. It's a feeling that I don't like. It leaves me restless and anxious. Unsure about where to go, what I want, and how to get there. I have to be honest and say, I've never felt this way before. I had a plan. A good one. Then my ship was reflagged and sold and it felt a little like getting punched in the mouth. A couple months ago I ran across a quote from Viola Davis and it really resonated with me. Losing my ship when I did couldn't have happened at a worse time in my career. I had just gotten my Captains license and, by being displaced I was set back years, actual years, in my quest to sail as Master. 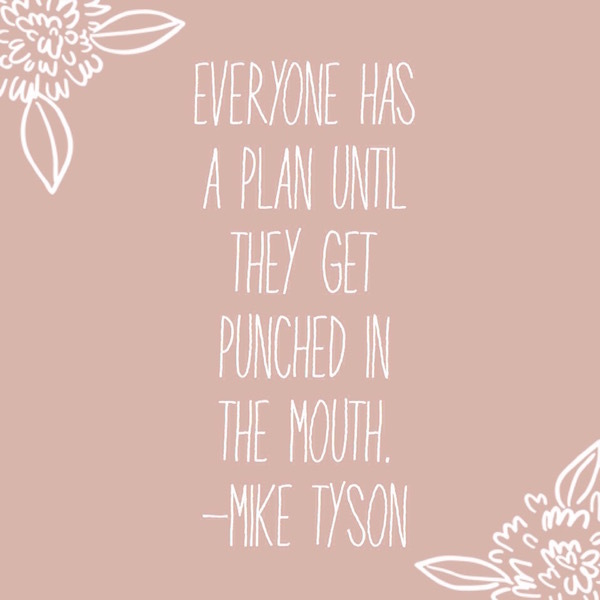 Except, that with most things in life 'getting punched in the mouth' has really taught me a lot. A lot about myself, about persistence, about not burning bridges....and about burning some that should be burnt, about family, about friends, about having a good attitude, about heart and home and about making the best of what you've got. Being 'punched in the mouth' and 'plan-less' has done one hugely important thing. It's taught me that I swim. Sink or Swim? I swim. I always have. Just keep swimming? I'm there. I refuse to sink? Damn straight. Which leads me to maybe one of my all time favorite quotes. Getting punched in the mouth, burning bridges, swimming for your life - these things help you. It never ever, ever feels like it at the time but, they define you. They make you stronger, they give you perspective, they show you what you're capable of. What do you do when plans go awry? Whatever you have to.